From front to back at the OLLC are East Clinton FFA members Kori Kile, Wyatt Riddle, Blake Williams, Avery Wood and Cade Stewart. 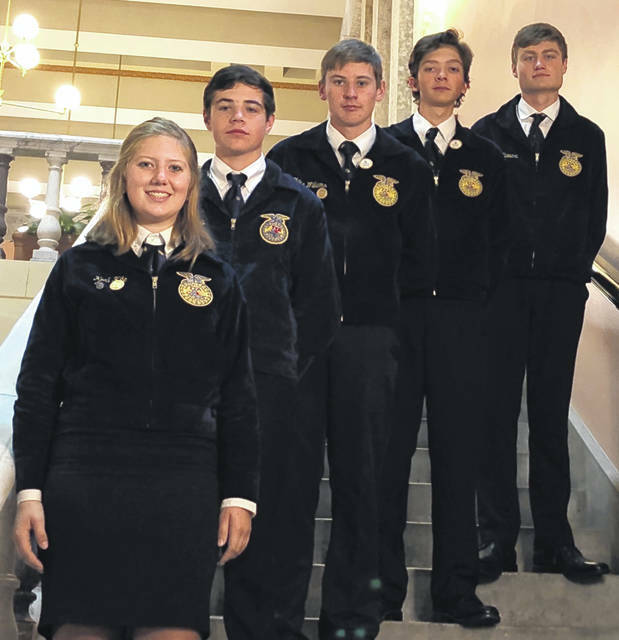 The East Clinton FFA Chapter recently sent five students — Wyatt Riddle, Caden Stewart, Blake Williams, Kori Kile and Avery Wood — to the annual Ohio Legislative Leadership Conference (OLLC) in the Ohio Statehouse atrium in Columbus. The students learned about what it means to be a leader as well as new achievements in the agricultural world. The group had a successful day working with new people, and developing leadership skills. “I learned a lot from this conference, and now I really know what it means to be a good leader to my peers,” said Wyatt Riddle. After the event the group participated in the “Milk Challenge”, an event where you are to go out and purchase 10 1-gallon jugs of milk from a local dairy farm or from a business that supports and purchases milk from local smaller dairy farms. The chapter accepted the challenge by going out and purchasing 10 gallons from Swallow Hill Jersey Dairy. The milk was then donated to Your Father’s Kitchen in Wilmington.